Dream Tents Sleep Aid for Children Pop Up Light Up Tent are fun pop up sleep tents that give your child their own private world at night. They function as a sleep aid, helping you get a good night sleep by surrounding your bed with a peaceful image. They are the perfect addition to your bedding collection. Combined with your favorite pillows, the Dream Tents Sleep Aid for Children Pop Up Light Up Tent is the ultimate sleep aid for your bedding. With so many sleep tent designs to choose from, you can go on a different sleep adventure every night! Theres an Undersea World, a Fairy Tale Forest, a Winter Wonderland, a Space Adventure, and so many more! Dream Tents Sleep Aid for Children Pop Up Light Up Tent make bedtime fun! 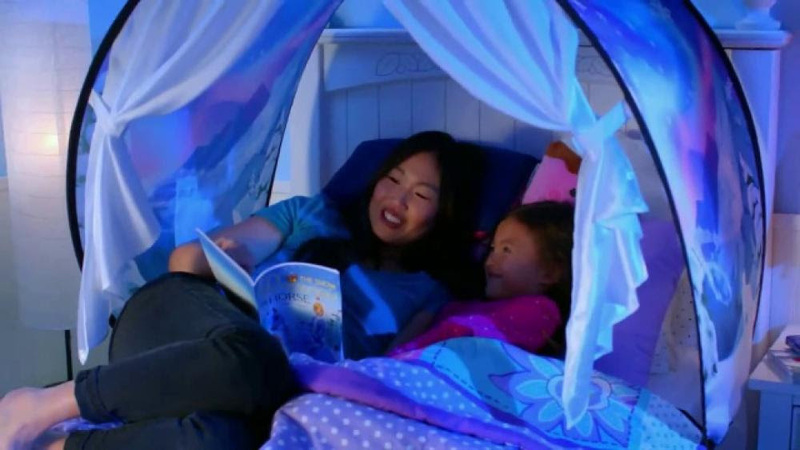 The pop up sleep aid tent come with a personal reading light, so your kids can have their own private magical reading nook. Dream Tents Sleep Aid for Children Pop Up Light Up Tent are easy to set up and easy to store. They instantly pop open and they fasten to the bed in just seconds. Theyre even great for college dorms! They work on all twin beds, even bunk beds! To store them, you just fold, and put away. Its that simple! Even great for college dorms!